Set in rural Montana in the early 1990s, emily m. danforth's The Miseducation of Cameron Post is a powerful and widely acclaimed YA coming-of-age novel in the tradition of the classic Annie on My Mind. Cameron Post feels a mix of guilt and relief when her parents die in a car accident. Their deaths mean they will never learn the truth she eventually comes to--that she's gay. Orphaned, Cameron comes to live with her old-fashioned grandmother and ultraconservative aunt Ruth. There she falls in love with her best friend, a beautiful cowgirl. When she's eventually outed, her aunt sends her to God's Promise, a religious conversion camp that is supposed to "cure" her homosexuality. At the camp, Cameron comes face to face with the cost of denying her true identity. 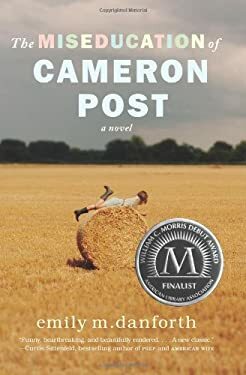 The Miseducation of Cameron Post is a stunning and provocative literary debut that was a finalist for the YALSA Morris Award and was named to numerous "best" lists. New (282 available) BRAND NEW. Over 1.5 million happy customers. 100% money-back guarantee. Make your purchase count: support Better World Books' worldwide literacy partners.